Health is created where people live, learn, work, and play. Health is not simply defined by lack of sickness or access to health care. 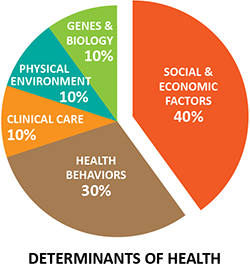 Research shows that health is determined by a variety of factors including social and economic factors, health behaviors, clinical care, physical environment and genes and biology (see graphic). Generations fosters multi-sector partnerships to improve population health. We are committed to enhancing collaborations and developing strategies that effectively improve the social determinants of health in our communities. Two primary initiatives around this strategy are Together for Health and the Community Health Worker Network.